It’s been almost 3 weeks since the last challenge, so how about a Super Crop Challenge? Okay, not a true super crop as this is a full-sized photo (is that a hint? ), but since it’s a close-up view of a limited area of the subject I’ll call it such. What is shown in the photo below, and what is the beautiful beastie that owns it? I’ll give 2 pts each for structure name and owner order and family. Genus identification is probably a stretch (though not impossible), so I’ll give 2 pts as well for correct subfamily and/or tribe. Standard challenge rules apply, including moderated comments (although tie-breaker points will be awarded to early birders with correct answers) and bonus pts for additional relevant information at my discretion. Good luck! This entry was posted in [No taxon] and tagged ID challenge, insects, nature, quiz, science. Bookmark the permalink. It’s a bit of a wild stab in the dark, but I’m giving this a shot: Coleoptera and I’m leaning toward Buprestidae based on the shape of what little I can see. No idea what structure it is though! A pretty good stab—the correct order and family earn you 4 pts. 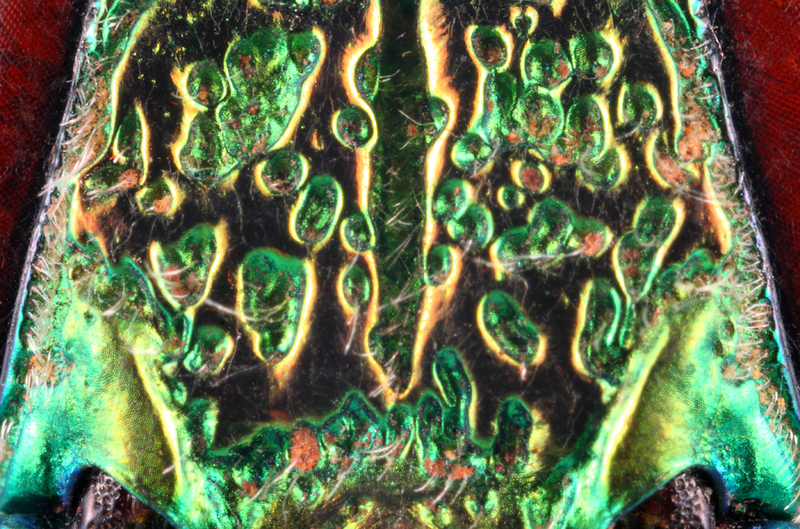 That’s a buprestid frons, with the antennal bases just visible along the lower edge. Since I have mostly NA taxa on hand, I can only guess based on those genera at hand, and of those, the one that is structurally most similar is Chalcophora; though the frons isn’t quite as flat, it does have a fairly deep central fissure like in the photo. I assume Chalcophorini is still a tribe? P.S. I just looked up the present placement, and evidently Chalcophorinae is now Chrysochroinae, so I’d go with that; your photo is probably some Polybothris or such in the same general group, but not exactly the same as Chalcophora s.s. Very good. You get points for order (but only 1 since you didn’t actually state it), family (although usually I insist on the proper noun), and (based on your later response) subfamily, as well as two of the three structures shown (frons and antennal bases). Within the subfamily Chrysochroinae, the genus Madecassia is much more closely related to Chalcophora (tribe Chalcophorina) than to Polybothris (subtribe Dicercini). Well, if the orange, faceted areas on either side are the eyes, then this must be the frons, with the antennae bases just visible at the bottom of the photo. That particular metallic sheen with the pitting looks a lot like the metallic wood-boring beetles that we see around here, so I’ll go with Coleoptera;Buprestidae for the order and family. A lot of Buprestids have hair on their frons, so I’ll go with some that look like they don’t and that appear to have the antennae pop out from under the frons like this: Subfamily Chrysochroina, Tribe Chrysochroini. And I’ve probably already gone off the rails by Subfamily, so this is probably a good place to stop. You are correct on all taxa from order down to tribe and the three structures as well. Nice job—you’re the only participant to have drilled down to the correct tribe! I’ll forgive the italicized order and family names (only genus and species are italicized), but I do have to deduct a point for the misspelled subfamily name (all subfamilies end with -inae, your spelling would be for a subtribe to which this beetle does not belong). Total = 13 pts and the win! I’m gonna guess that this is one of the metallic wood-boring beetles in the family Buprestidae. The visible structures would be the compound eyes, the bases of the antennae, and the frons. Everything is correct except the tribe—nice! Sorry insect anatomy not my strong point so I’m going to say it’s the ‘forehead’ of a coleopteran of some kind. (Possibly ‘vertex’? Struggling to find a better name). I’m fairly sure we’re seeing the eyes top right and left and the antenna bases at the bottom of the picture. I might come back a bit later with a guess as to the family! “Forhead” and frons are equally okay, as are eyes and antennal bases. I’ll also give you the 2 pts for “coleopteran”, although as I mentioned to Doug I prefer proper names for taxa rather than their adjectives. I believe it is a member of the family Buprestidae (order Coleoptera), and that the structure is the pronotum. If I hazard a wild guess I would also say it is Agrilus planipennis. The correct order and family nets you 4 pts. Correct order and family, but different subfamily. Prosternum is a good guess, as many buprestids have that part highly sculptured, but it is the frons. What is pictured is the frons of a member of the Buprestidae (Coleoptera). Also visible is the first antennomere at the point of insertion, and the reddish structures on either side are the eyes. If I had to guess I would say Buprestinae: Buprestini, possibly in the genus Buprestis. I should have insertion of the scape. Yes, Buprestidae (Coleoptera), but a different subfamily (not North American :)). I’ll give you full points for all the structures (scape and first antennomere are equally okay). Thanks Ted, I figured it was probably foreign and therefore beyond my experience and expertise. The frons on most of ours have regular punctation and so the confluent irregular punctures puzzled me. The only thing I could find that was even close was a male Buprestis viridsuturalis. Thanks for introducing me to such a beautiful species from such a marvelous part of the world. Our chalcophorines have similar sculpturing on the frons, but of course they are not screaming iridescent green! Full size photo…..really big metallic coleopteran First impression: dorsal abdomen of a large Buprestidae with little leg insertion areas but it CANNOT BE there must be abdominal plates. So….dorsal median mouth area – can maxilla or palp insertions look like these? maybe………. ……and it is a beetle Ted would be really interested in. Hmmmmm. So I guess this is a mouth on a Metallic Wood Boring Beetle. Not exactly the mouth, but close enough that I’ll give you a ‘horseshoe’ point. Those aren’t palps, but the antennal bases at their insertion on the frons. Taxa-wise, you get credit for order, family, and subfamily. Nice guesses below that, but unfortunately not correct. You are, however, the only person to mention the distinctive pits and their possible olfactory use, as well as the micro-pitting on the surface around the insertion points, so I’m giving you 4 bonus points for those observations. Wow – I was way off ………….and you are being too generous!!! Structures shown: eyes, frons, and antennae. Full points for order, family, and the three structures shown.